View the page flip publications on your iPad, iPhone, Android and more. Convert your PDF to impressive digital flash page flip book in seconds. Fully customized viewer, allows you to change your ebook look&feel. Unlimited conversions without paying royalties. Flip PDF for Mac is a Mac application that helps you convert page flip pdf in a few minutes and publish it to your web site. With Flip PDF for Mac, you can create and publish unlimited number of e-books. Readers can access your publications anywhere, anytime and all of the links stay active. 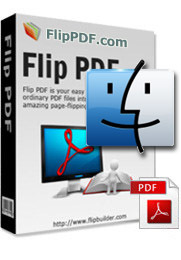 Flip PDF for Mac is the most easiest to use PDF publishing software for Mac use , This program can convert PDF to Flash Page Flip book with cool page turning effect, allowing you to customize everything as you proceed with the conversion. It is a great sollution to impress your customers and readers by remarkable digital flippingbook, and helps you to reduce time and cut costs with publishing your print media online! Flip PDF for Mac offers fully customised desktop page turn direct from PDF files and fully customisable mobile apps for publications using our suite of apps for both Apple and Android devices. At a Glance: Easy! Even a new user, you can use Flip PDF for Mac within a couple of minutes without any special learning. 6 Define template details, like book margin, background image, read orientation, hard cover, autoplay etc. With our easy to use interface, you can make a vivid flash page flip PDF from traditional PDF documents in a few mouse clicks! Even a new Mac user, you can use Flip PDF for Mac within a couple of minutes without any special learning. Logo – You can remove Flip PDF logo in Flip PDF for Mac. You can also add your company name in the publication and link to your home page. Add/remove buttons on navigation toolbar -, you can select to show or hide "Sound", "About", "Thumbnails", "Share", "Print" buttons or right click menu items in the output PDF to flash page flipping book. Change background - If you do not like the default gray background, you can change background color in the converter console. You can also add background music to the whole flash page flipping publication. 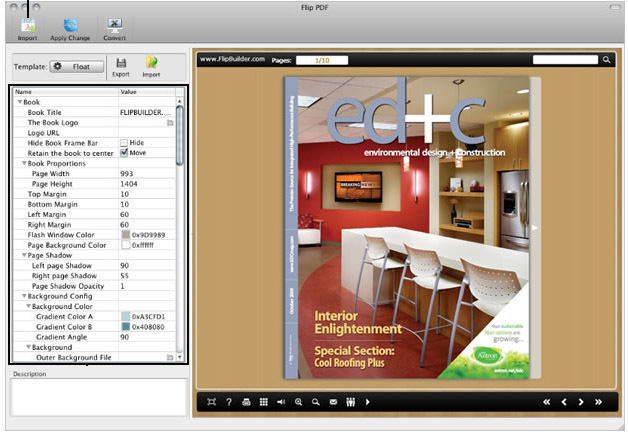 Beside Flash version, all publications created by Flip PDF for Mac will also include HTML5 version. The readers will be able to open your flip page publication in any environment (PC, Mac, iPhone, iPad, Android, or Windows Mobile), and you can even publish at your Facebook page. Flip PDFfor Mac supports analyzing and importing table of contents from PDF files. After that, you can edit the imported table of contents. If you want to create it by yourself, instead of importing from PDF, or your PDF does not contain a table of contents, Flip PDF for Mac can help you to create table of contents for your digital publication. With Flip PDFfor Mac, you can designate adjacent pages as the "Table of Contents". Here you can define a text link to each main category of your publication. The table of contents support unlimited links. Flip PDF for Mac is available for both Windows and Mac platforms, both have the full features available and allow you to create your digital publications in minutes. Customise the flippingbook look and feel of both the skin and interactive features by choosing from your preferred colours, background, sounds, layout, style, visual page transitions and button controls. The digital publications can match your brand so it really looks the part. Use the built-in social bookmarking tools to promote your flash page flip book. Share your publication on sites such as Facebook, Twitter and Digg. Support Multiple language interface: select English, French, or Spanish languages for the navigation buttons of your Flipbook; More than 3 languages are provided for output requirements. You can also change the orientation the flipping pages are turning. Contact us to add more output languages. Upgrades are always free. Once you have purchased the flipbook software, you can use it forever. We reserve the right to raise price for later versions, but you don't need to pay one cent for upgrading. We believe our flipbook software is exceptional value and work very hard to make sure this remains true. 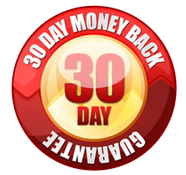 If you are dissatisfied with our service for any reason, you will receive a full refund. Just request a refund by emailing us at support@flippdf.com. High quality Converting of PDF to Flash. 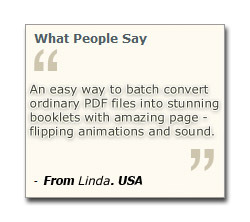 Batch convert multiple PDF files to a single or multiple page-flipping flash magazine. Import the hyperlinks, bookmarks and text from original PDF files. 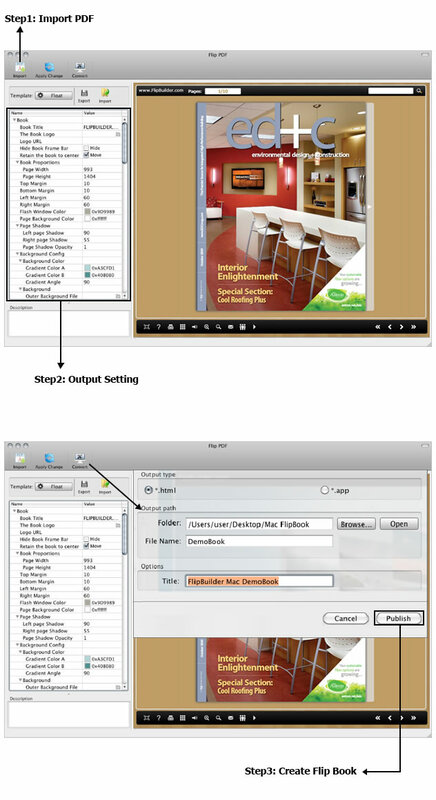 Previously set quality and size settings for output page flip pdf. 2. Output to different formats: HTML, Mac App, Mobile version. Export and save settings for future uses.